A swollen clavicle, or collarbone, describes the presence of fluid accumulation or any enlargement found in or around the clavicle, though this swelling may not always be related to the clavicle itself. This swelling is often caused by damage to the soft tissue found over the clavicle, though swelling of the actual bone can occur. Continue reading to learn more about the symptoms, causes, and treatments available for a swollen clavicle. Symptoms that are often associated with the swelling of the clavicle are pain, restricted arm movement, numbness that radiates from the clavicle to the arm, issues when trying to carry heavy items, red skin that is painful to the touch, and tenderness. Swollen clavicles can be caused by a variety of issues that vary in severity, including injuries, infections, and growth disorders. Below is a detailed list of its potential causes. Injury: One of the most frequent causes of a swollen clavicle is an injury to the bone or surrounding tissue. Car accidents, falls, and sports injuries can cause the clavicle to fracture and result in swelling of the muscles and ligaments. Bone disorders: Some bone growth disorders, such as Paget’s disease, can cause frequent swelling of the clavicle. The constant breakdown of the clavicle results in malformation that causes swelling and pain. Infection: Though it is rare, an infection in the clavicle can result in swelling and pain in the surrounding tissue. Vitamin D deficiency: Not getting enough vitamin D results in a reduction of calcium, which in turn may cause bone deformation that results in swelling. Arthritis and osteoarthritis: The wear and tear on joints that is characteristic of arthritis and osteoarthritis can result in the entire clavicle appearing swollen. Bone tumor: A bone tumor can cause swelling and must be treated as soon as it is discovered, as it can be very serious. Joint problems: If the joints surrounding the clavicle become inflamed, it may cause swelling of the clavicle. Swollen lymph nodes: Sometimes the swelling occurs not in the clavicle, but in the lymph nodes that surround it. 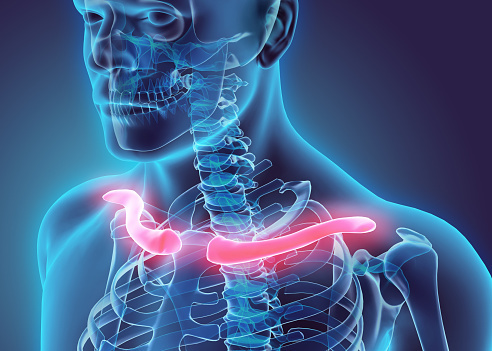 Lymph nodes usually swell due to an infection in the mouth, teeth, scalp, or lungs. How to treat a swollen clavicle? Treatments for a swollen clavicle depends on the cause. For example, if your clavicle is swollen due to an injury or fracture, treatment will most likely include keeping your arm immobile with the use of a sling. If the swelling is caused by arthritis, pain medication and rest are the most common treatments, though you may require physiotherapy and even surgery. Treatment of the underlying infection is necessary to reduce swelling due to swollen lymph nodes. A swollen clavicle may be the result of an injury, arthritis, or even an underlying infection. If you notice swelling along with pain, redness, or tenderness, it is important to contact your doctor. A proper diagnosis and treatment plan will be developed to help your clavicle return to normal as soon as possible.